Here’s an exclusive for Pier 33 Boaters. Get ready to Share Summer with your friends, family, neighbors and fellow boaters! 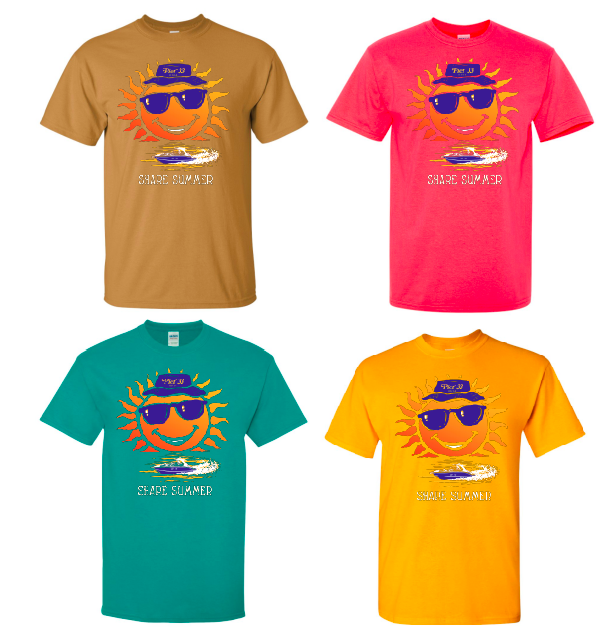 We’ll have a nice selection of colors, sizes and multiple styles (men’s tee shirts, ladies’ tee shirts and ladies’ tanks and kids’ sizes, too). The tee shirt design is similar to our 2018 shirt, but with new colors for 2019. TWO free shirts (per Dock/LOC/HNG/Storage boat), during the 2019 Pier 33 Spring Open House. Get first choice of sizes, colors and styles by attending Saturday or Sunday, March 16 or 17. Colors, sizes and styles are limited to the quantities available.